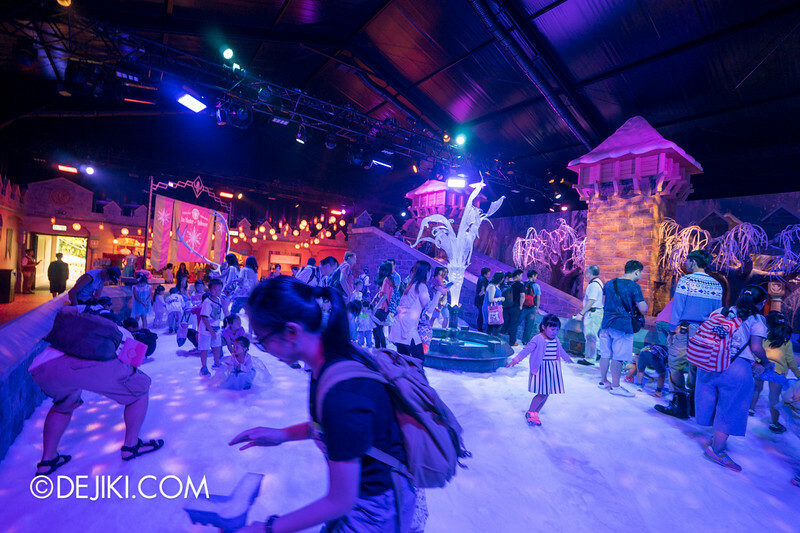 Frozen Village is a new themed area in Hong Kong Disneyland, as part of the park’s seasonal entertainment for summer 2015. It’s located in between Adventureland and Grizzly Gulch. 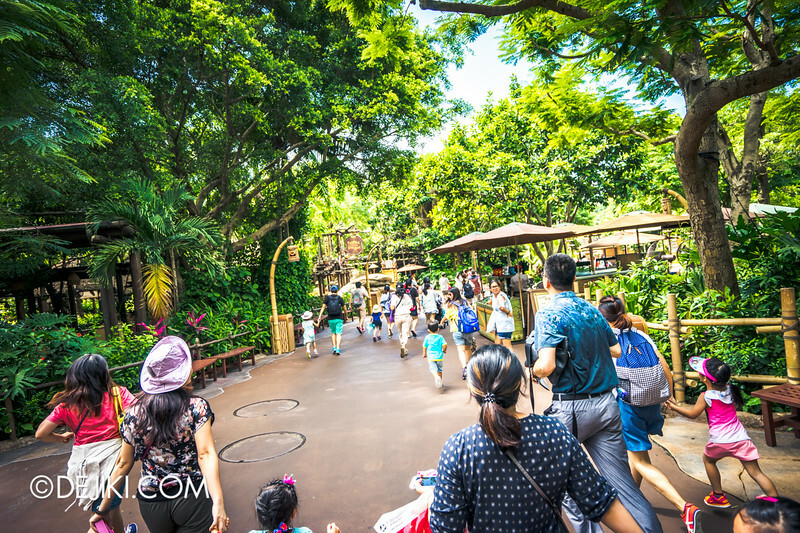 If you’re at the park early, expect a mad dash! 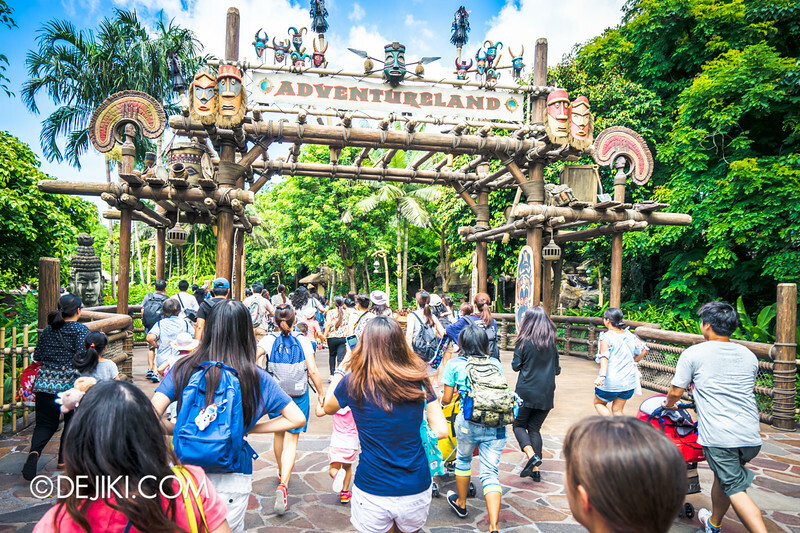 I’ve never seen this happen in my past visits to Hong Kong Disneyland. 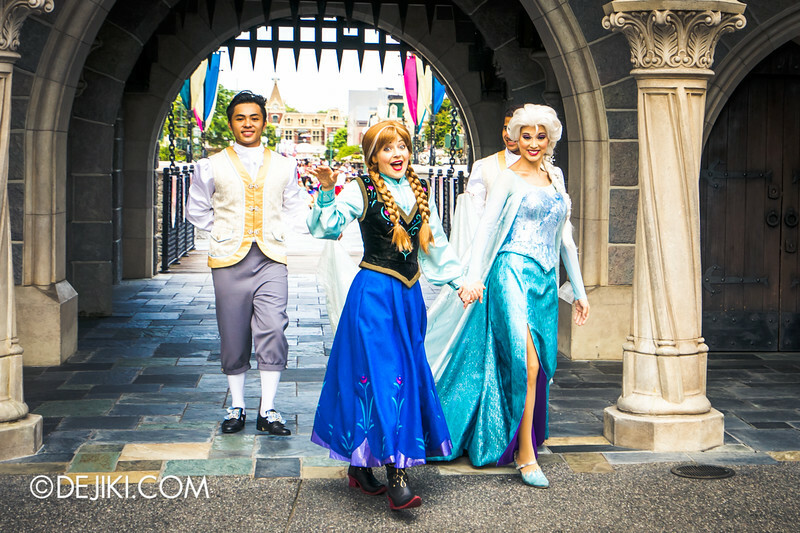 Guests usually rush to the characters at the Castle Forecourt. 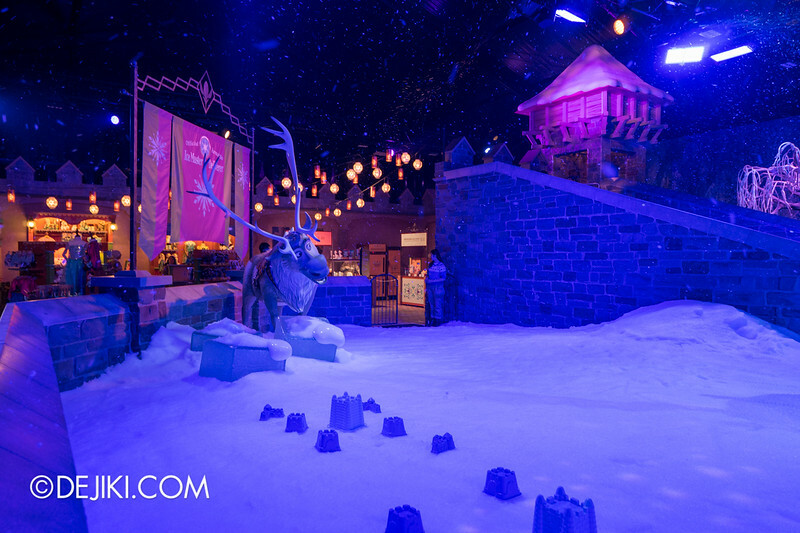 When you arrive at the entrance to Frozen Village, there are two lines. The one on the left: Standby. The right line is the queue for Reservation Pass Distribution. 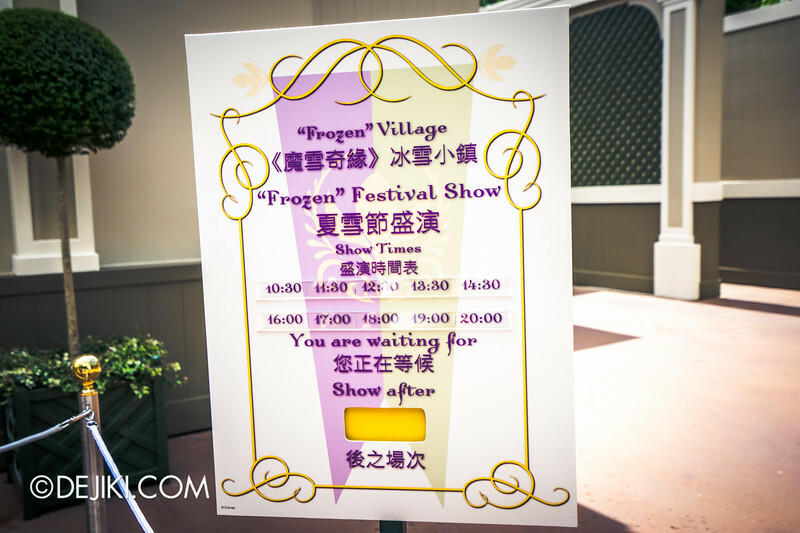 Due to limited capacity of the theater and village square, long wait times are expected. The Reservation Pass acts as a Fastpass of sorts. 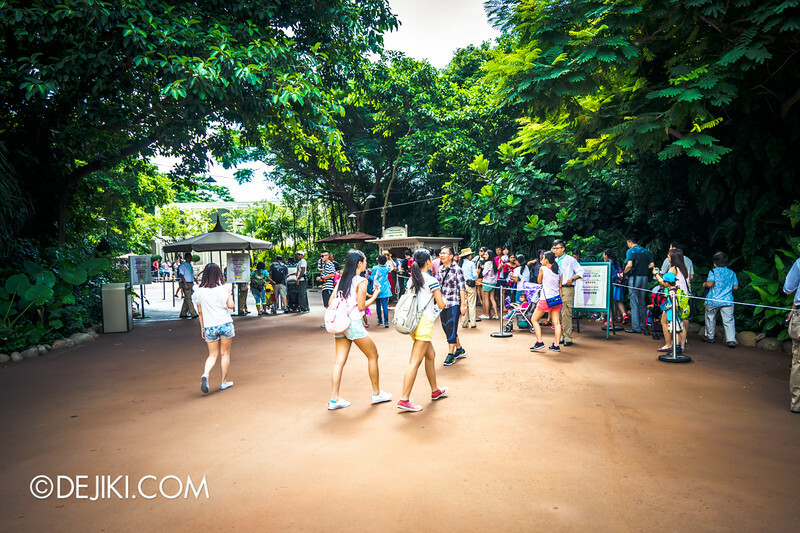 So you can collect the pass and come back later to avoid the long Standby line. Reservation Pass is distributed on a first-come-first-served basis. Park tickets are not scanned, so it’s possible to get more than one per park ticket (if you love the show so much). 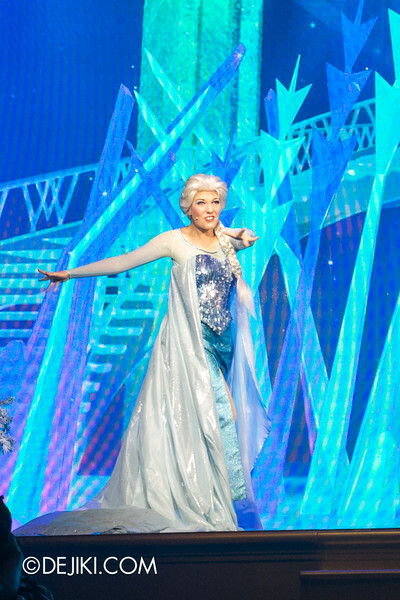 This show is so popular that it is performed 10 times on most days. 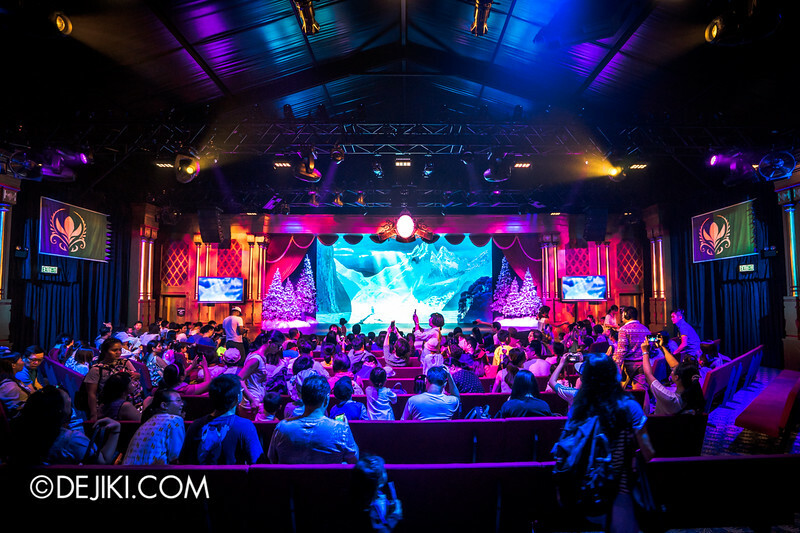 Frozen Village, comprising the Crown Jewel Theater and Frozen Festival Square, takes place inside this show building. 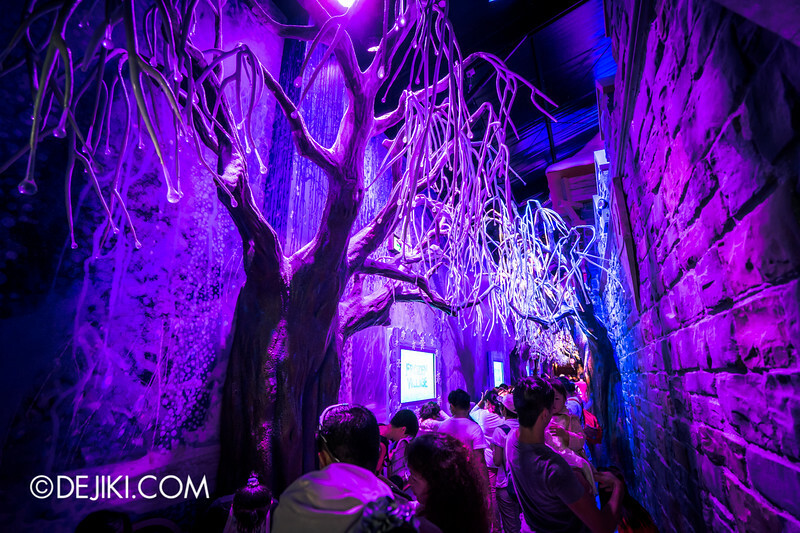 It is a flexible event venue that is used for the park’s high-budget Haunted House attractions (Demon Jungle and Revenge of the Headless Horseman) during Halloween. Apparently the building’s exterior has been enhanced greatly this time. 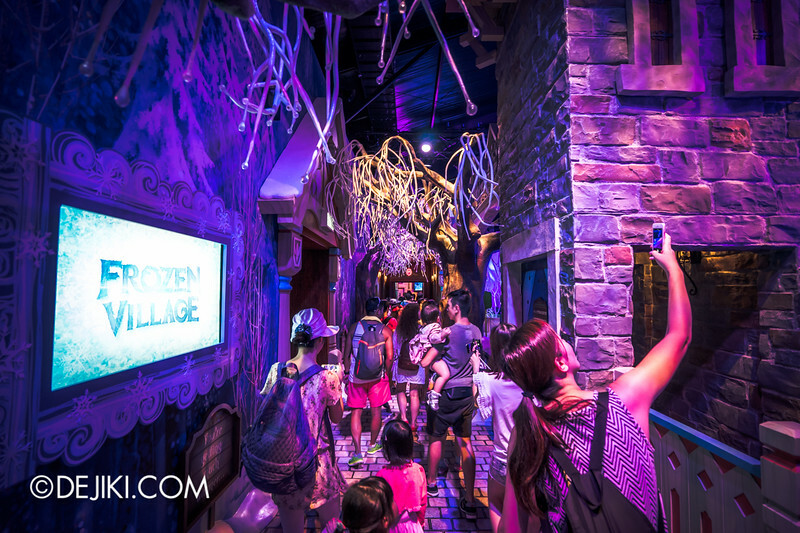 It’s really warm during summer in Hong Kong, so we were thankful for the rush of cold air as we stepped into Frozen Village. 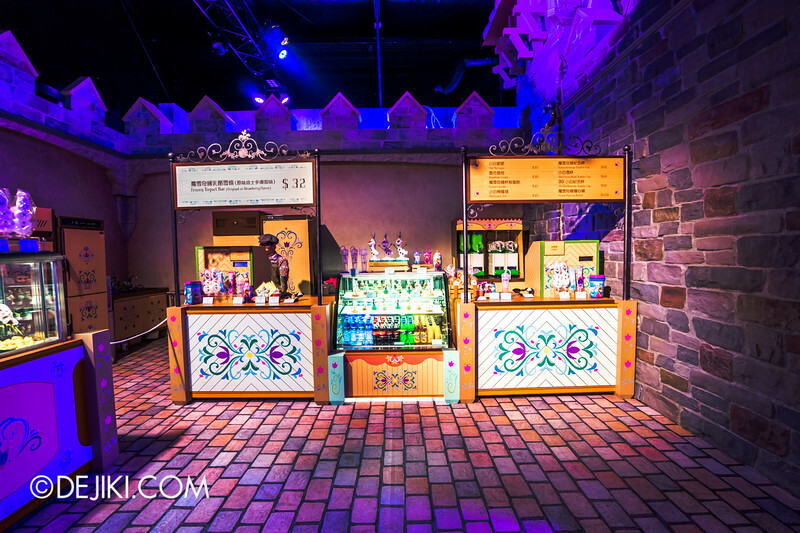 Guests are held in this corridor while waiting for the doors to the Crown Jewel Theater to open. Those at the front will get to see parts of the festival square. The Crown Jewel Theater looks decent for a seasonal event. There’s comfortable seats and even carpets! You might recognise this if you’ve seen it before. 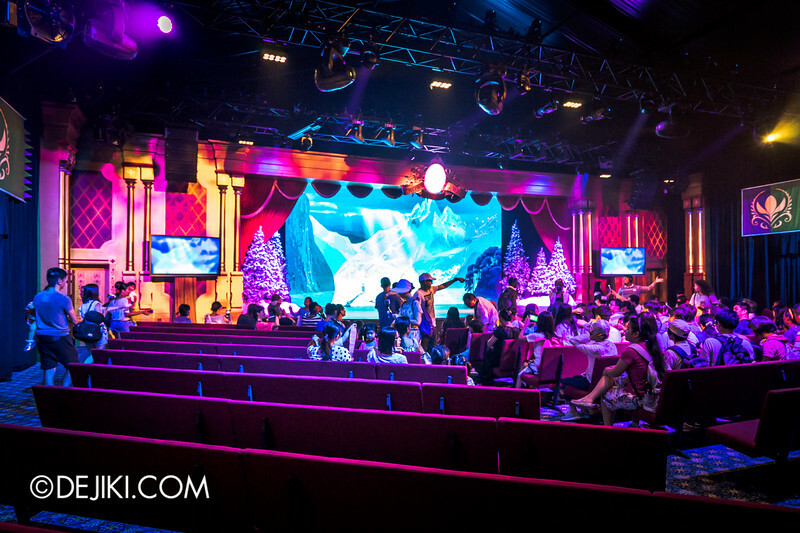 Yes… This is Hong Kong’s version of For the First Time in Forever: A Frozen Sing-Along Celebration – they even kept the name – Crown Jewel Theater. 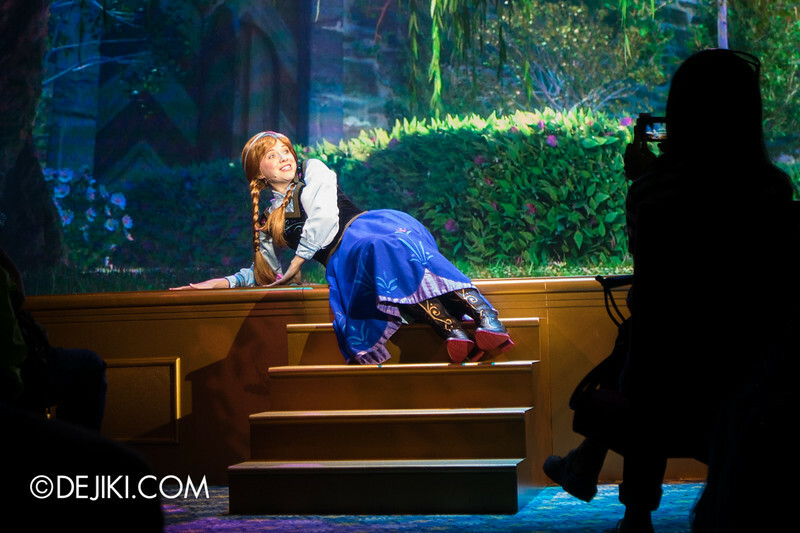 As the story of Frozen is already quite well-known, the narrative cut short. 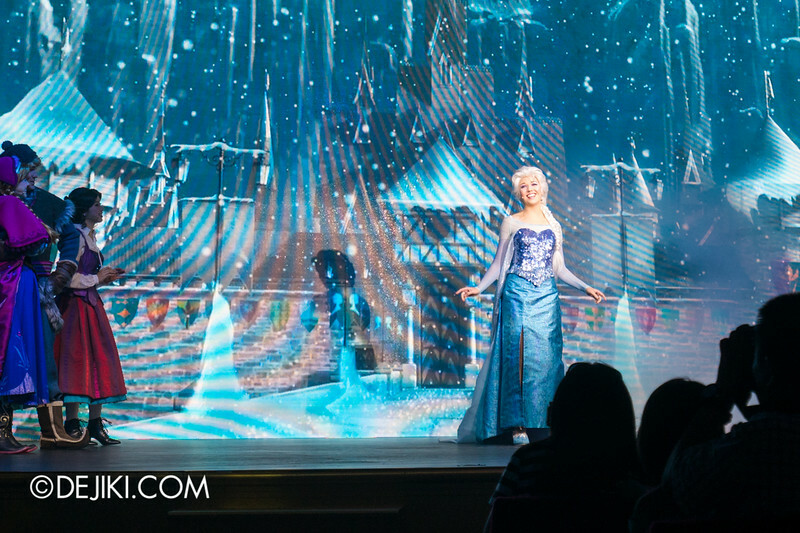 So it’s a Sing-Along show – and all the iconic songs of Frozen are included. If you’re still a fan of the songs, then you’ll love this show. Otherwise you’ll have to endure 20+ minutes of Frozen again, but this time with lots of children singing along to the songs in the cutest way possible. 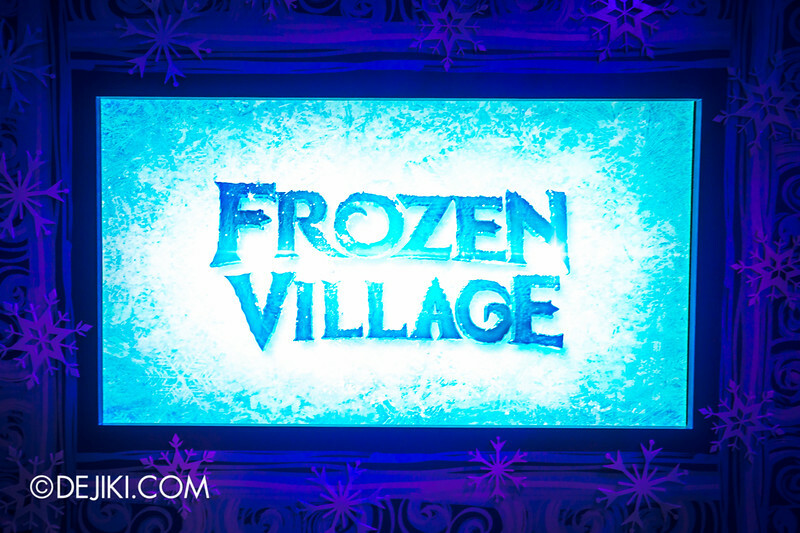 You can’t skip the show to get to the other parts of Frozen Village. 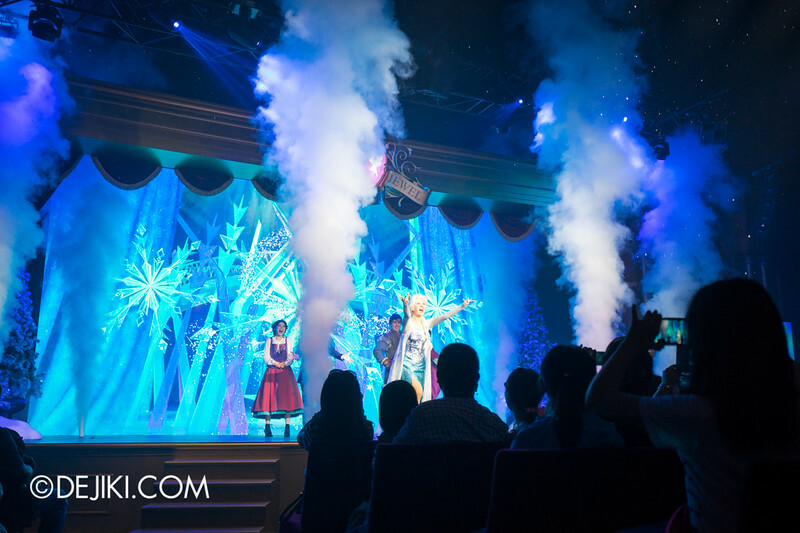 Perhaps the most surprising part is the use of cryo jet machines for Elsa’s snow blasts. Many of them were hidden on the stage and they were so powerful that blasts reach the ceiling. Have a look! The cast poses at the finale for photos (but this is not a meet-and-greet) and the doors finally open. The Festival Square is a large play area with a frozen floor. 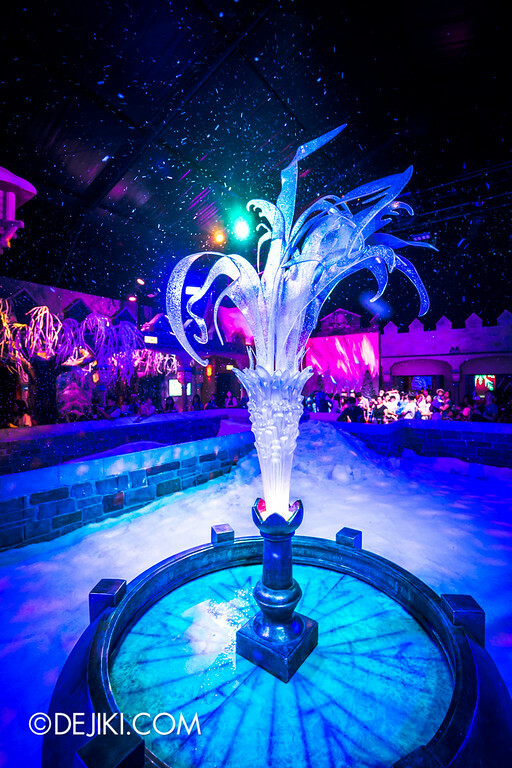 It’s real ice that can be played with. 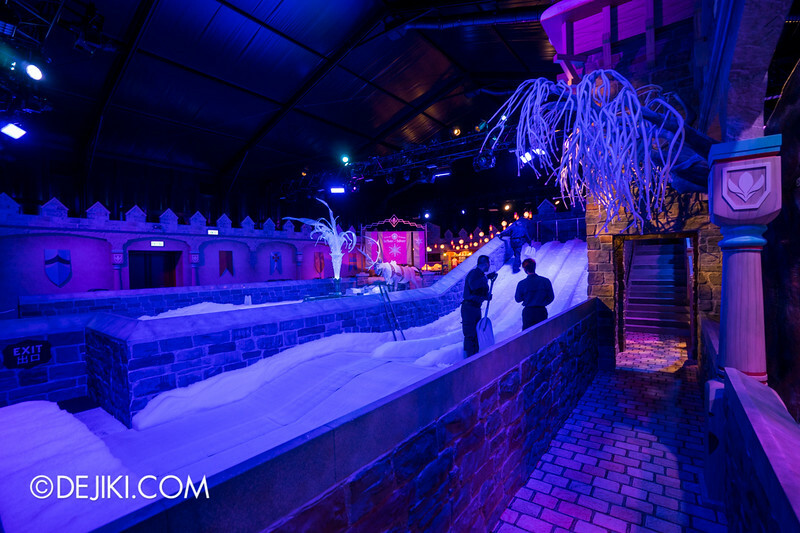 On one side of the play area is a small ride – Kristoff’s Toboggan Slide. 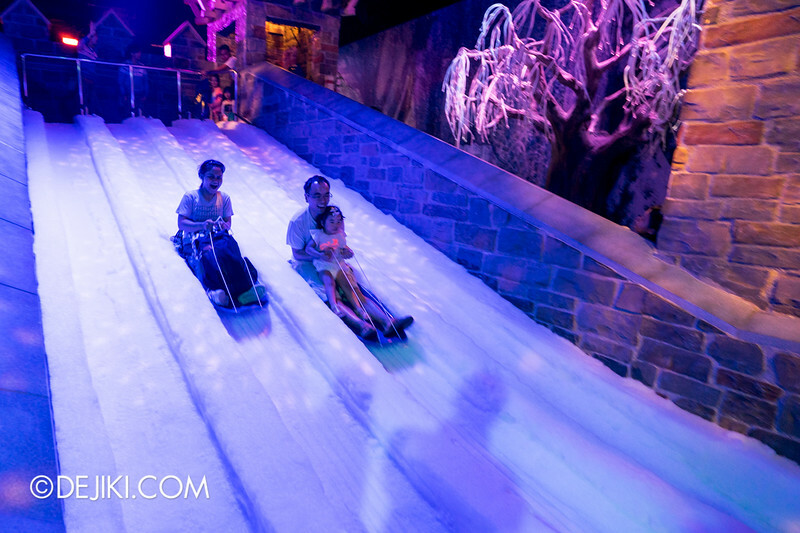 The slides are made up of sculpted ice. It’s a very short ride that ends with a little air time. 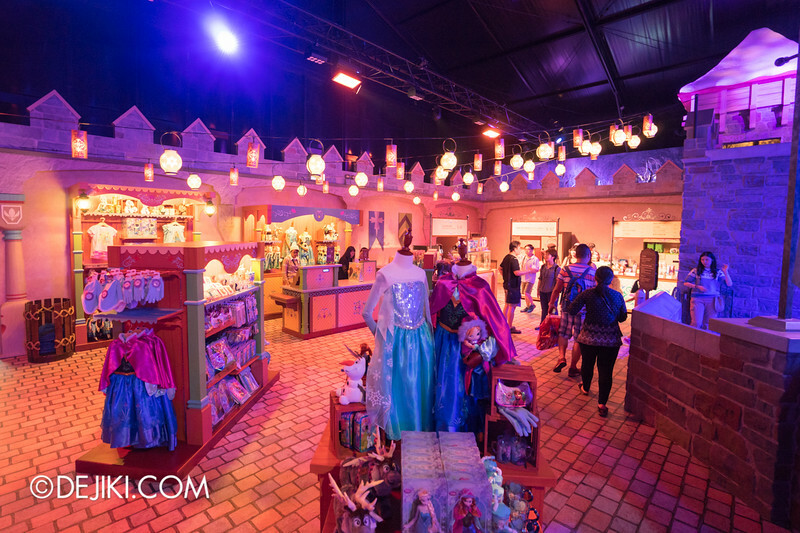 Oaken’s Trading Post is the last area of Frozen Village. A young princess’ dream – and their parents’ nightmare. 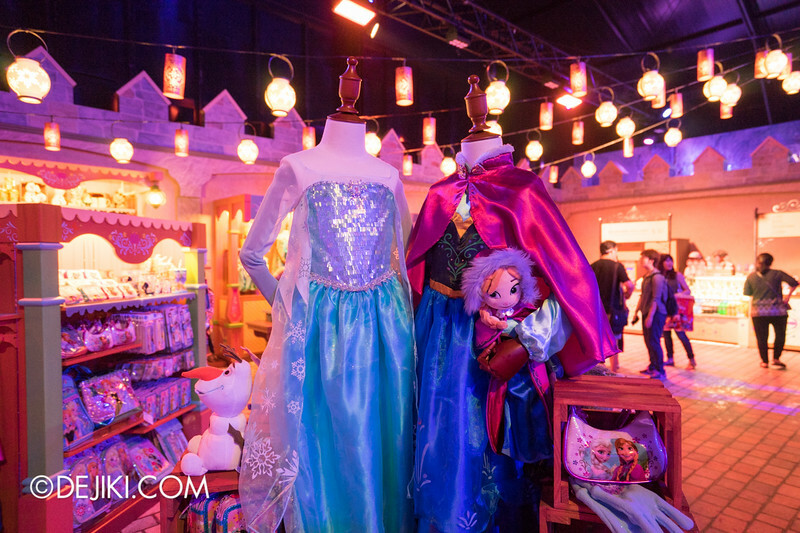 There are many young girls wearing Elsa and Anna outfits. 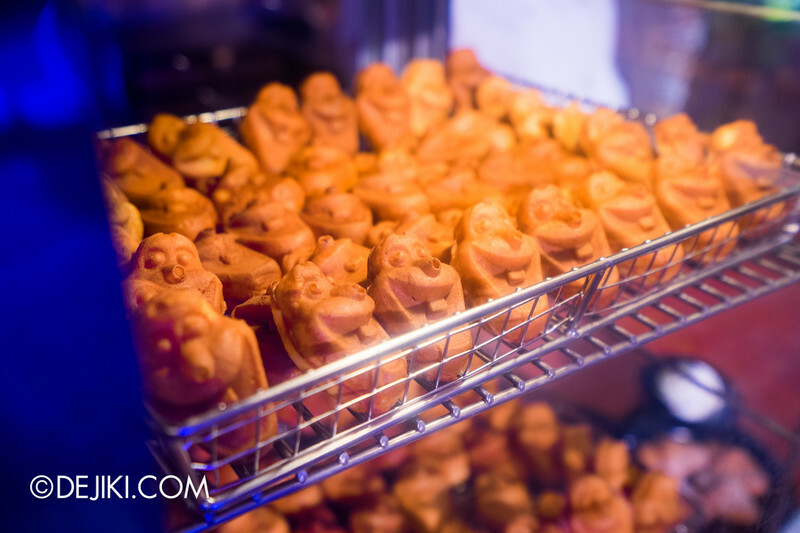 Some special snacks are also sold here, exclusively, and most of the other F&B merch are themed to Olaf. 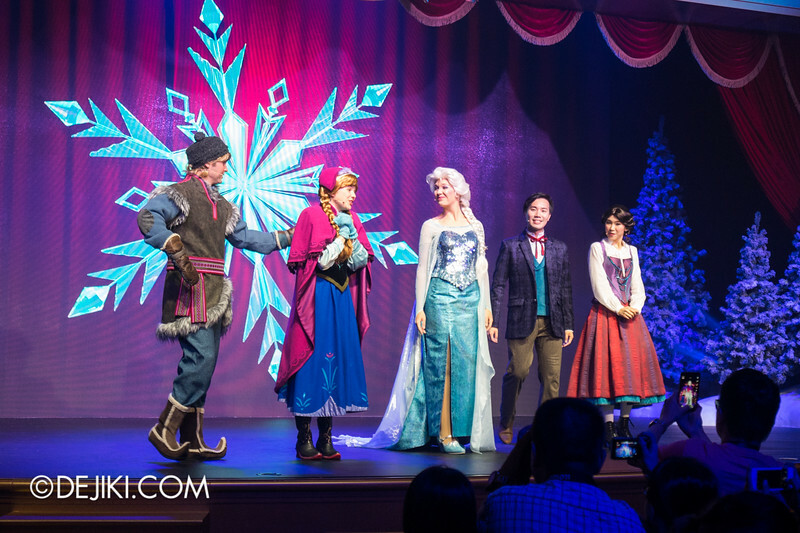 There is also another interactive show at the Sleeping Beauty Castle forecourt, known as Frozen Processional, where there are more meet and greet opportunities for children (many young girls wearing costumes from Frozen) who have registered at Fantasyland. 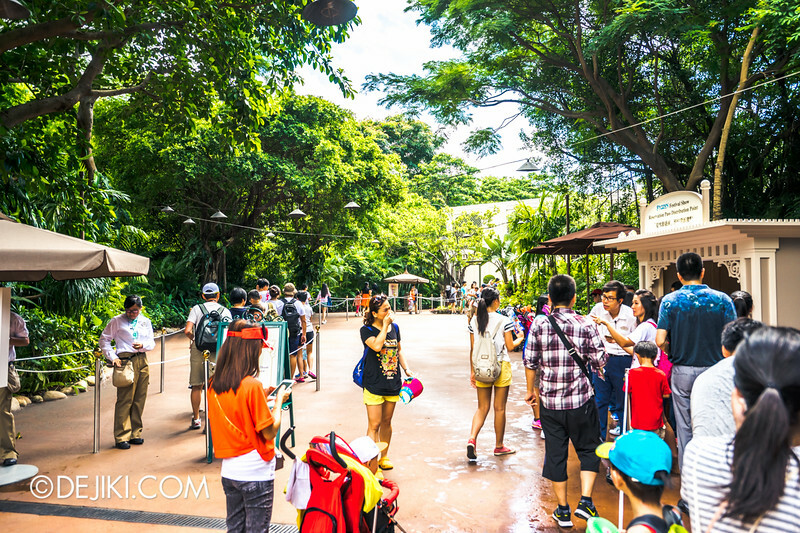 The weather is really warm during June-August, so it wasn’t surprising to see guests enjoying this chilly getaway during summer, especially when the other parts of the park are just hot hot HOT! 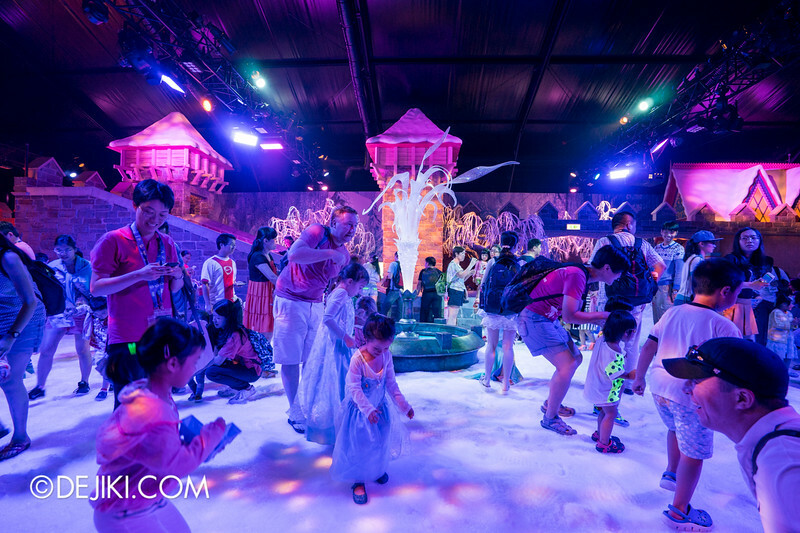 Frozen Village is open at Hong Kong Disneyland from now till 30 August 2015. Looks like the popularity of Frozen is still very much alive. Even after two years, Disney is not letting it go. 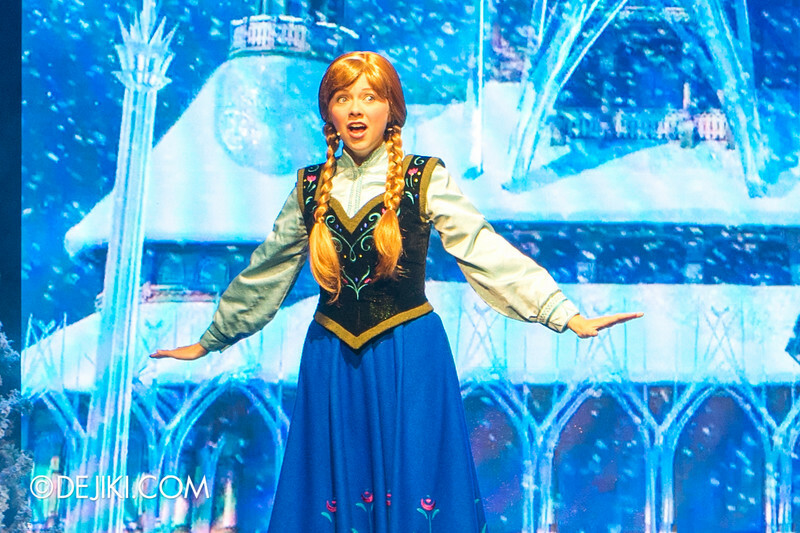 We’ll see Arendelle added to Tokyo DisneySea in the future. I’ve been waiting for this post! I think it’s quite boring that the theater looks the same as it does at Disney’s California Adventure. Some unique theming would be nice. In my opinion, Frozen is a good movie. I liked it when I first saw it. However, it’s everywhere now. It’s Frozen all over. Not that there’s anything wrong and it’s totally understandable, but it’s a bit much now. 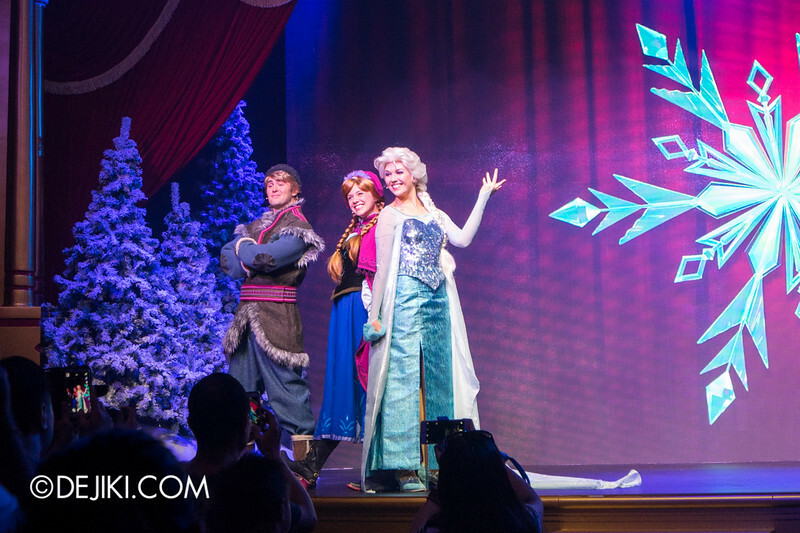 They even included Frozen as part of Disneyland Park’s version of the ‘Pain the Night’ Parade. By the way, that version is awesome! I’ve seen the HKDL version in person and loved it, but I find some of the additions in the California version worthwile, including the puppet Tigger, Genie and Lumiere. I also wanted to ask: Do you have any idea what new show is replacing The Golden Mickeys at HKDL? I’ve read that it’s going to be a princess show and I’ve seen the Disney Auditions page putting up audition notices for character vocalists like Merida, Elsa and Tiana, for a new offering, though the name of the show wasn’t provided. The new show is called Mickey and the Wonderous Book. 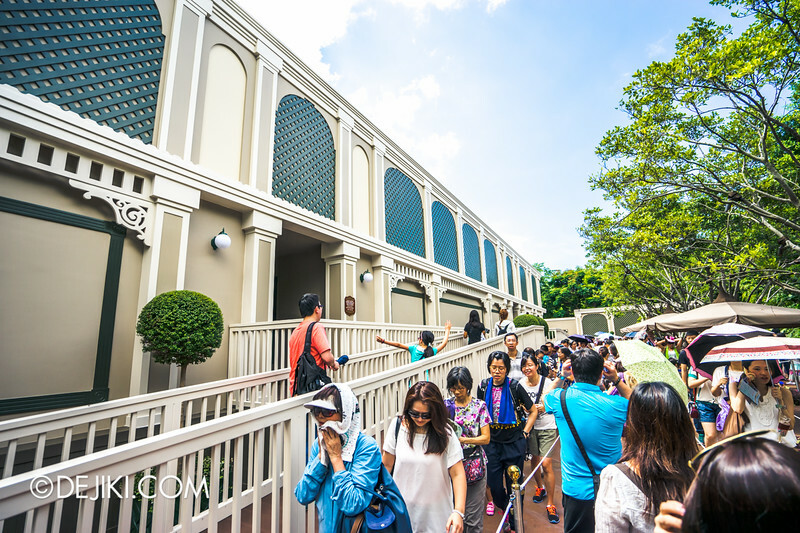 It will open in November 2015 and feature some characters that didn’t receive much limelight at HKDL so far, some of which you have mentioned. 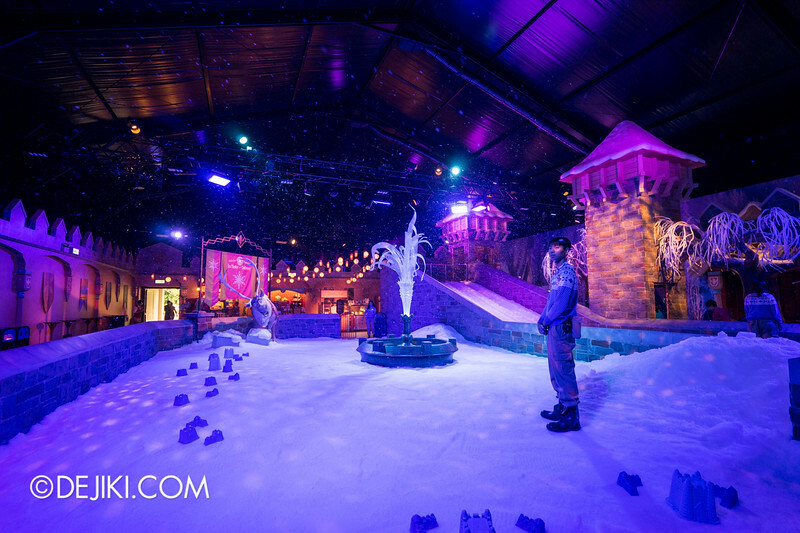 They actually demolished the RHH show building before building Frozen Village. May I check if you hear anything with regard to HK Disneyland 10th Year Anniversary Celebration..? There is no big celebration event, but the park will be introducing new permanent attractions and shows. By the way, is there any special merchandise that they are selling i.e. 10th Anniversary merchandise? As last year they had launched some 9th Anniversary merchandise. Yes, there is a number of 10th Anniversary merchandise in the similar products as past years, such as T-shirts, Souvenir Tins, Mugs and Pins. I’m so confused… the tracks exist for these songs in both Mandarin and Cantonese. Why are they doing it in English?